DESCRIPTION OF THE BOOK: Thirteen-year-old Wax’s life may not be perfect. But that doesn’t stop him from spinning some of the sickest beats on their Brooklyn block… but he’s a better DJ than he thinks. One night, while making a mixtape for his crush, Wax scratches the perfect beat and responds to an interstellar challenge that transports him and the entire block to the robot-filled planet of Discopia. Mistaken by the locals for a master of the futuristic, sound-bending martial art known as SCI-FU, Wax finds himself on the wrong side of a showdown against the Five Deadly Dangers and their leader, Choo Choo. With help from the sci-fu master Kabuki Snowman and Wax’s crew—including his best friend Cooky P, his sister The D, and even his crush, Pirate Polly—Wax has to become a sci-fu master or risk losing Earth forever! 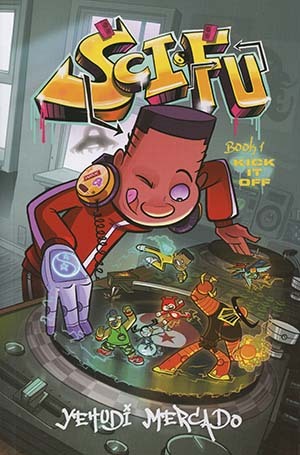 MY TWO CENTS: Sci-Fu is a love letter mixtape to all things 80s hip hop that can be appreciated by middle grade readers and adults alike. It’s a book that demonstrates the power of graphic novels to speak to the senses: the colors and lettering, heavily influenced by graffiti art and 8-bit video game graphics, are so vibrant and kinetic that you can almost hear the music popping off the page. At the end, writer-illustrator Yehudi Mercado includes a link to a Spotify playlist of iconic old school hip hop that will make you want to re-read the book while listening—and actually, I’d recommend it. Main character Wax moves through his hero’s journey against a psychedelic sci-fi background, first in a diverse, multilingual 1980s Brooklyn alive with cool characters, fashion, and of course, sick beats, and then on to Discopia, the alien robot planet Wax has to save. He dreams of becoming the best DJ in the universe, but also struggles with normal kid problems, like fending off bullies and finding the courage to talk to his crush. Under the tutelage of his alien Sci-Fu sensei, Kabuki Snowman, and support from his friends and family, Wax faces off against a team of fantastical villains that, in classic hip hop fashion, are clearly sampled from some of the best of 80s pop culture. He’ll learn the skills he needs to save the universe and come into his own as a DJ and a person in the process, learning valuable lessons about hard work, friendship, and standing up for oneself. There is a lot to love about Sci-Fu, especially its cast of interesting supporting characters. Pirate Polly escapes the typical love interest trope with an exciting side plot and destiny, and smart, take-charge little sister The D deserves a spin-off series of her own. Sidekick Cooky P is a loyal friend who pushes Wax to keep improving, and ice cream-truck driving guardian Uncle Rasheed provides some comic relief in the form of dessert-flavored expletives. The villains rap, in a fun twist on typical superhero-fight banter, and bring their own surprise swerves to the storyline and its eventual resolution. Many elements, from the plot to the characters to the visual style, are clear homages to music, films, and even other comics. Perhaps strongest here is the “boys adventure” plot type, like the classic Stand by Me or modern throwback show Stranger Things. However, refreshingly, here we get a kids adventure with a mix of genders and backgrounds, and a plot firmly rooted in African-American and Afro-Latinx culture. This is not the 1980s of frizzy perms and synthesizer pop. This is tracksuits and sweatbands, Pan-African pendants, chunky hoop earrings and roller skates, and De La Soul. And the best part is, it’s only Book One. Writing: Students could be encouraged to write raps (and rhymes) about their own lives in alternating pairs, just like many of the tracks we hear from Wax and Cooky P.
Using onomatopoeia to tell stories: Many of the sound effects in Sci-Fu are examples of onomatopoeia (click, BOOM, whing) or in the Sci-Fu martial art, slang words (wiggedy wack) can be used as attacks. Ask students to illustrate scenes using onomatopoeia sound effects to bring their stories to life. Kung-Fu: One aspect of Sci-Fu that could be better explored is the major influence of kung-fu and martial arts. Research the history of kung-fu and martial arts in American culture, especially in film and its impact on Black culture (for example, on breakdancing). History of hip-hop: Learn about the history of hip hop, especially around when Sci-Fu takes place. Visit online collections such as The Cornell Hip Hop Collection and the Hiphop Archive & Research Institute to see examples of early intersections between hip hop and visual culture (graffiti, DJ flyers, zines). Create zines or flyers inspired by these works. ABOUT THE AUTHOR/ILLUSTRATOR: Yehudi Mercado is a self-proclaimed Pizza Laureate, cartoonist, writer and animator living in Los Angeles by way of Austin, Texas. Yehudi spent many an afternoon in detention during his formative years and credits that “thinking about what you’ve done time” for his unstoppable imagination. As a latchkey kid, Yehudi would choreograph elaborate kung-fu fight scenes set to his Run-D.M.C. and Beastie Boys records, thus providing the foundation for Sci-Fu. His projects as writer-illustrator include Rocket Salvage, Hero Hotel and Pantalones, TX. ABOUT THE REVIEWER: Marcela was born in Brazil and moved to the U.S. at the age of three, growing up in South Florida. She is now the Library Director at Lewiston Public Library in Maine. Marcela holds a Master of Library and Information Science degree from the University of Illinois at Urbana-Champaign, where she concentrated on community informatics and library services to teens. She is a copy editor for NoFlyingNoTights.com, has served on the Will Eisner Graphic Novel Grants for Libraries jury, and speaks about comics in libraries at library conferences and comic conventions. She can be found on Twitter @marcelaphane and Goodreads. Joe Pi’s almost full name is Jose Pimienta. He was born in the Imperial Valley and raised as a Cachanilla in Mexicali, BC. During his upbringing, he was heavily influenced by animation, music and short stories. He’s been drawing as long as he can remember and loved analyzing everything on the TV screen. After high school, he left his garage band and ventured toward Savannah, Georgia, where he studied Sequential Art and discovered the wonders of Storyboarding. He also discovered a wider variety of music, traveled more and made friends. By the age of 24, he ran into a good suggestion, which was to move to SoCal and pursue a career in storyboarding. In 2009, he packed his belonging and drove to Los Angeles, with a friend. Nowadays, he resides in Tujunga where he takes walks every morning along with a big cup of coffee. He draws comics, storyboards, and sketches for visual development. 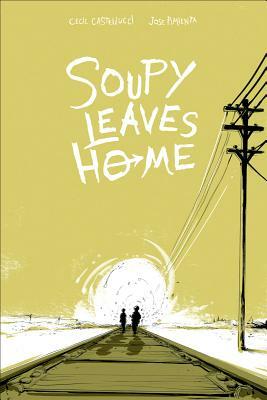 Joe’s latest book is the YA graphic novel Soupy Leaves Home, a historical fiction story by Cecil Castellucci set during the Great Depression. He was kind enough to talk to us about his background and work as an artist. Did you read comics as a kid? What were your inspirations for becoming an artist? Unfortunately, I didn’t read many comics as a kid. I tried getting into superheroes several times, but they never really hit a chord with me. It wasn’t until my teens that I discovered other graphic novels, manga, and slice-of-life stories in comics that rocked my world. I did, however, read a lot of newspaper strips, but I also felt that wasn’t my fit for the type of stories I wanted to tell. As a kid, my inspirations tended to come from animated movies, books with illustrations and music videos. As long as I can remember, I’ve always liked all those “making of-” featurettes and interviews with film makers and artists. They tended to reveal parts of the process and how a piece of art (whether it was a cartoon, a movie, or a song) was made. So, I guess I was inspired to be an artist by learning more about the arts I liked. The thought seemed logical: I like this Art and this is how they’ve done it and I want to do that because when I try it, I love it. Conclusion: learn more how to do it and keep going. Please tell us a little bit about the tools you used to draw Soupy Leaves Home. On regular type paper, 8.5 by 11 and a mechanical pencil (0.5, to be precise). I draw 1″ by 1.5″ rectangles and that is the thumbnail for a comic page. I draw my thumbnails small while reading the script, so it helps me to plan out the pace and what the beats of the story are. That way I know if I want to build up to a big scene or if I want to keep a steady pace for a few pages. After that, I draw on 9×12 2-ply bristol board. Personally, I like the Smooth surface better than the Vellum, but sometimes, Vellum is all the store has, so… ANYWAYS, I draw the page with a blue-lead 0.5 mechanical pencil. I keep my pencils a bit loose, but knowing that I can tighten up later with the inks. Once the pages are approved, I ink on top of the original pencils with micron pit pens, brush pens, India ink and brush, liquid paper white-out, and sometimes a few fountain pens. After that, I scan the pages and color them digitally with Photoshop. In this stage, I also do some more specific edits, such as deleting certain pencil marks that I couldn’t erase, or making sure the white out looks cohesive on the page. If the blacks look a bit too strokey, or if I just want a solid black instead of having visible brush marks, this is the stage to fix that. After that, my editor takes my files and has a letterer do that which I cannot: letter the book. Those are all my tools: papers, 0.5 mechanical pencils, brush pens, India ink and brush pens, AND Photoshop. Soupy Leaves Home joins a growing field of comics of all genres, aimed at a teen audience. Are there other titles you recommend to people looking to read more YA comics? 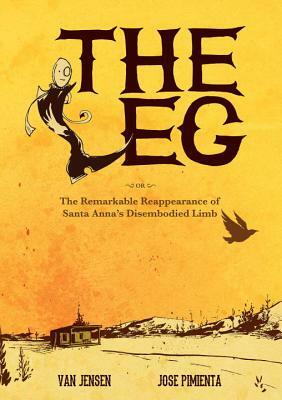 The Leg by Van Jensen and… me, hehe. While comics for kids and young adults has been exploding as a publishing field, there have been comparatively few Latinx authors and artists getting attention, with the exception of the Giants Beware and Lowriders series. What advice do you have for young Latinx artists looking to break into comics? Dear Latinx who want to break into comics: Be bold, fearless, humble, and optimistic. Bold, because it reflects confidence and strength. Fearless, not just because of the current atmosphere, but also because that’s how we fight fear mongering, which is used to keep us quiet and divided. Humble, because, it reminds us that there is a bigger picture in our society, and that which benefits our community, automatically helps us grow to be better individuals living together. And optimistic, because as artists, our spirit is essential, so it’s important to keep it bright. About breaking into comics? We can post and share. Ask everyone for support, launch Kickstarters, look at companies that you’re interested in, and see their submission guidelines and follow directions, while showing why your stories matter and why they’d be a great fit for their company. Go to conventions near you, small or big (of course they can be expensive, but plan for that. See how many you can make it to), make minis to hand out to show what you’re interested in doing. Go to conventions of what you like (for example, if you like baking, wrestling, cars or music; go to those conventions) get a small vendor table and sell your comic (about baking, wrestling, cars or music.) Starting a Patreon account, I hear, is a popular avenue these days. Most importantly: KEEP GOING. Do not stop making art and telling others about it. I’ve heard several quotes, and the one that still fits best is: It’s a marathon, not a sprint. Do not give up sharing your stories. On a last note, see if I can end well here: When I first became interested in comics, I wished I had known more Latinx cartoonists (which there were, but I didn’t know about that many). To those who see my work, I hope I can make a positive impression, but furthermore, I hope that they go on to make art that inspires even more people.